"Many of the readers of your newspaper want to know how I am experiencing this last period of my life." During a meeting with cardinals Feb. 11, 2013, Pope Benedict stunned the cardinals and the world by saying, in Latin, "After having repeatedly examined my conscience before God, I have come to the certainty that my strengths, due to an advanced age, are no longer suited to an adequate exercise of the Petrine ministry." The day before he left was a Wednesday and the overflowing crowd in St. Peter's Square made it clear that it was anything but a normal Wednesday general audience. Pope Benedict on his 8-year pontificate: It was a time of "joy and light, but also difficult moments." He told an estimated 150,000 people that his pontificate, which had lasted almost eight years, was a time of "joy and light, but also difficult moments." "I am a simple pilgrim who begins the last stage of his pilgrimage on this earth." The retired pope's letter to Corriere della Sera echoed remarks he had made the afternoon of his retirement when he arrived in Castel Gandolfo and greeted crowds there before the very dramatic, globally televised scene of Swiss Guards closing the massive doors to the villa and hanging up their halberds. "I am a simple pilgrim who begins the last stage of his pilgrimage on this earth," he told the people. "But with all my heart, with all my love, with my prayers, with my reflection, with all my interior strength, I still want to work for the common good and the good of the church and humanity." 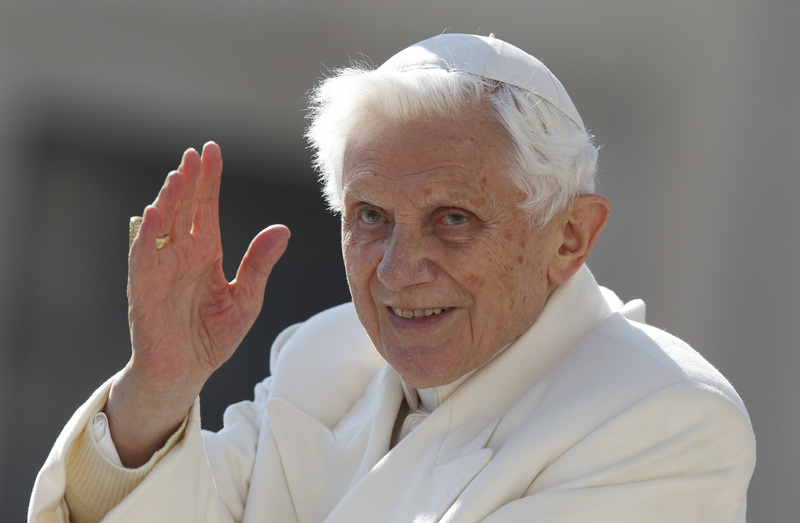 In "Last Testament," a book-length interview with journalist Peter Seewald published in 2016, Pope Benedict insisted he was not pressured by anyone or any particular event to resign, and he did not feel he was running away from any problem. However, he acknowledged "practical governance was not my forte, and this certainly was a weakness." Insisting "my hour had passed and I had given all I could," Pope Benedict said he never regretted resigning, but he did regret hurting friends and faithful who were "really distressed and felt forsaken" by his stepping down. Now that this respected conservative, Pope Benedict, is preparing to die, this would be a good time for him to officially, in writing, support his successor, Pope Francis, whom many of his supporters reject. Josheph Ratzinger, while still Pope, addressed Cardinals and pledged his loyalty to his successor. Pope Francis has lost much support, not because of Benedict, but because he has been AWOL on many of his duties as Pope.